Home / President / Prayers Requested for Professor Ron Olowin, R.I.P. Prayers Requested for Professor Ron Olowin, R.I.P. It is with a heavy heart and deep sadness that I inform you that Professor Ron Olowin, after a year of illness, passed away peacefully this weekend in the presence of his family and loved ones. Professor Olowin began teaching at Saint Mary’s in 1987 and devoted his life to understanding the cosmos, drawing star-strewn connections between scientific observations, religion and human culture, and sharing his wealth of knowledge with his students. He was an exemplar of a dedicated teacher in the Lasallian tradition, which focuses on the relationship between the teacher and the student. Many alumni remember Ron—affectionately referred to as “Dr. O” by his students—for the legendary Intro to Astronomy course, which he created upon arriving at Saint Mary’s and continued to teach for 30 years. On hearing the sad news, Provost Beth Dobkin said, “Ron was a beloved colleague and I, and many others on our campus, will miss him dearly. His passing is a tremendous loss for the countless people whose lives he touched. He exemplified the best of our faculty, with contributions that span intellectual achievement, excellence in teaching, and sustained engagement with the Saint Mary’s community.” In 2004 Ron was recognized by the Alumni Association with the St. John Baptist De La Salle Award, which honors a faculty member for their extraordinary commitment to our students. In 2008 he was recognized by his colleagues as Professor of the Year. It was through his determined efforts that the Geissberger Observatory was installed on the hill near the cross. For Ron the observatory served as a highly visible symbol of the serious science conducted at Saint Mary’s. Over the course of his illustrious career, Professor Olowin authored more than 40 articles for scientific and popular publications. He delivered papers in more than a dozen countries, which also gave him the opportunity to view the heavens from many vantage points. 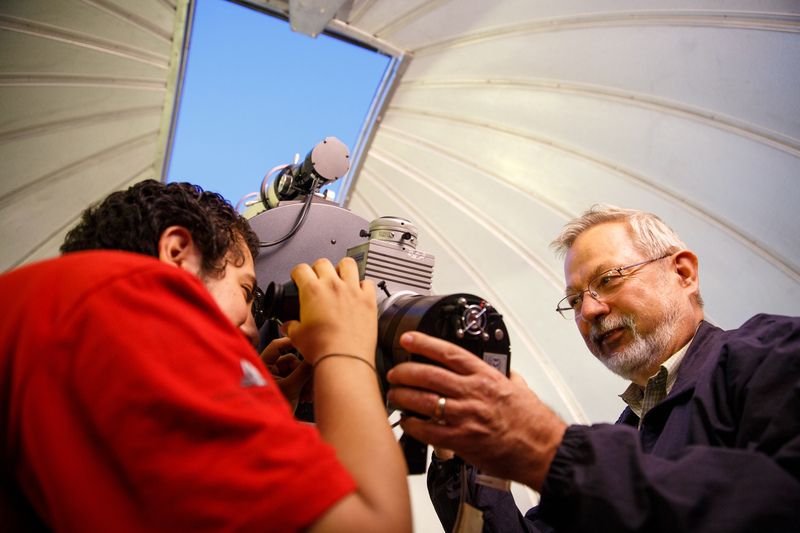 He took his astronomy students to Arecibo, Puerto Rico, where they were able to maneuver and guide a telescope that was, until recently, the largest single-aperture telescope in the world. He served as a visiting professor and guest lecturer at the Graduate Theological Union (GTU) at Berkeley, teaching courses on cosmology and ecotheology. He was a member of the Center for Theology and the Natural Sciences in Berkeley and visiting scholar at the Biblioteca Apostolica Vaticana in Rome. He was a member of the American Astronomical Society, a fellow of the Royal Astronomical Society and the International Astronomical Union, serving on committees in cosmology, history of astronomy and astrobiology. He was a member of the International Federation of Catholic Universities, chair of the international executive committee of the Inspiration of Astronomical Phenomena and ex-president of the Robinson Jeffers (Poetry) Association. We will share details regarding service arrangements and contact information to celebrate Ron’s life in the days ahead. In the meantime, please keep Ron, his family, and everyone he touched in your thoughts and prayers. Professor Ron Olowin's funeral will be at St. Perpetua Church in Lafayette on Saturday, August 26 at 10:30 a.m. The evening before, Friday, August 25, there will be a Vigil Service at Saint Mary's College Chapel at 7:00 p.m. Donations may be made in Professor Olowin's honor to the Ron and Mary Olowin Memorial Gift, for the support of the Christian Brothers' educational ministry in Myanmar under Brother Ling John. The address is De La Salle Institute (DLSI) at 4401 Redwood Road, Napa CA 94558. Donations may also be made to the St. Perpetua Church Capital Campaign, for the purpose of building a new social hall for the parish. The address is St. Perpetua Church, 3454 Hamlin Road, Lafayette CA 94549. Expressions of condolence may be sent to Mary Olowin by email at mary@olowin.org or to the Olowin home 3333 South Lucille Lane, Lafayette, CA 94549.